The last time MMM sat down at his laptop to bang out this weekly recap, some 168 hours ago, the Tigers were on a five-game winning streak, the White Sox were on a five-game losing streak, and Detroit had finally re-captured first place, by 1.5 games. Today, the White Sox are the ones in first place by 1.5 games, and the Tigers are the team trying to right themselves. That's baseball. That's all part of the game's fascinating, humbling 162-game season. Give the Chisox credit. They left Detroit a week ago Sunday looking like a team whose wheels might fall off, then they went on a five-game winning streak in which they found their hitting touch and even took two of three from the two-time defending AL champion Texas Rangers. It was a tough week on the banks of two of the Great Lakes---Erie and Ontario. Progressive Field in Cleveland continued to vex the Tigers, who are 1-5 there this season. And Rogers Centre in Toronto wasn't any kinder, though the Tigers did end the week on a winning note there. It all added up to 2-4, a week after 6-1. The week began with Monday's off day trade of pitching prospect Jacob Turner, catching prospect Rob Brantly, and low minors pitcher Brian Flynn to Miami for 2B Omar Infante and RHP Anibal Sanchez. When MMM laid out the pitching order for last week, he reminded you that Turner's Saturday start would only occur barring a trade. Anyhow, MMM is pleased that GM Dave Dombrowski appeared to patch two holes with one deal, though Sanchez can be a FA after this season. Infante scuffled last week in his return to Tiger Nation, but MMM isn't concerned. It's a huge upgrade from the Santiago/Raburn/Worth trio. As they ask in the National Enquirer, how was your week? It's Jhonny Peralta this week, by a Tiger's whisker over Doug Fister. The Tigers offense has gone back into scuffling mode, and the last thing they needed was a three-game sweep at the hands of the Blue Jays. Enter Peralta, who slammed two homers, providing all the offense in Sunday's 4-1 win. Jh-P hadn't had a hit on last week's trip until he busted loose in Toronto. His timing couldn't have been any better. Peralta edges out Mister Fister, whose gem on Sunday also came at a great time. But without Peralta's offense, Fister's outing would have been just another wasted effort. Ironically, it could have been Peralta, had he not had his breakout game on Sunday. But MMM is going with Brennan Boesch, mainly because he represented, in MMM's sometimes twisted mind, the struggles of the Tigers' 5-9 hitters last week. Manager Jim Leyland kind of called Boesch out, though not by name, when he ranted before Saturday's game that certain guys have to start driving in runs, and pronto. It didn't take a rocket scientist to figure out that Boesch, Alex Avila and Delmon Young (who WAS mentioned by name) were who the skipper was talking about. Boesch's BA continues to hover around the very mediocre .250 mark, and he disappears suddenly and often, something that MMM finds very annoying. Last week Boesch might as well have been on the side of a milk carton. He was 3-for-23 with six strikeouts, no runs scored and one RBI. But then this week he might be 10-for-25 with a couple bombs and six ribbies. Last week MMM put Dombrowski UtM because of the impending interleague, non-waiver trading deadline. But even though DD made the Infante/Sanchez trade, there's still time before July 31 for another move. But MMM won't cop out and put DD UtM again; that would be taking the easy way out. But it's food for thought. Instead, MMM is taking his forceps and placing Infante UtM. Well, his arrival was looked at as sweet relief for a fan base tired of looking at second base and seeing a black hole. But Infante went 2-for-14 after arriving, and while that's a tiny sample size, you can bet that if he keeps scuffling, he won't be flying under the radar for too long. Still, MMM feels MUCH better seeing Infante's name in the no. 9 spot, rather than the aforementioned trio of second basemen the Tigers have tried this year. The other reason for the UtM designation for Infante is that if he has a good week at the plate, watch the over-the-top reaction from the fan base on places like MLive and sports talk radio. It'll be the 180 degree opposite from the reaction to another tough week for Omar. It'll be a hoot! Another un-Tigers-friendly ballpark awaits the Boys this week: Fenway Park. The venerable old baseball theatre, 100 years old, hasn't been a great place for the Tigers in recent years, 2012 being no exception. The Tigers dropped 3 of 4 in Boston in May, and that was against a Red Sox team that has been underachieving all year. The Red Sox are still "meh," hovering around .500, but they could be hovering around .400 and still give the Tigers fits---in Boston. Justin Verlander would normally have a shot at starting twice this week because Thursday's off day might have allowed Leyland to skip Turner's start, but with Sanchez in the rotation, JV will get an extra day off after Tuesday's start in Boston and will take the mound next Monday against the Yankees in Detroit. The Red Sox still have Wild Card thoughts dancing in their heads, despite a hundred mediocre 2012 games. Thursday is a day off and then the Indians come calling. Cleveland had a good series against the Tigers last week but sandwiched around those three games has been some bad and mostly losing baseball for the Tribe. The Tigers haven't had much success against the Indians in Cleveland or Detroit this year, and that has to change right now, especially since MMM is squeamish about what might happen in Boston this week. That's all for this week's MMM. See you next week! What a fun, frollicking week of baseball for the boys at Comerica Park last week! Yeah, they got scorched by the Angels, 13-0 on Tuesday, but that was the only blemish as the Tigers put together a 6-1 homestand, their first since the All-Star break. The epic week catapulted the Tigers into first place, all by their lonesome, 1.5 games ahead of the White Sox, who got broomed in Detroit over the weekend. The Tigers took no prisoners. They hit, they pitched, they caught the ball, they threw the ball, they were stone cold solid in the clutch. Miguel Cabrera hit his 300th career home run, Quintin Berry hit his second, and Brennan Boesch just hit home runs of various numbers. Tigers starters got stingy and the bullpen even stingier. There was no foolishness defensively. Basically, the Tigers played, in one week, as if they were trying to make up for the season's first three months. MMM has been saying it since late April: the Tigers' struggles have been because a select group of 2011 heroes have been 2012 goats. Brennan Boesch was among that group---until recently. In fact, he was UtM as recently as last week. Boesch, the sometimes perplexing right fielder, had a great week. He sliced balls to left, drove them up the middle, and rocketed them into the right field seats. He hit with no outs, with one out, and most importantly, with two outs. It was enough to make MMM cry tears of joy. For if Boesch can hit like this down the stretch, the Tigers are in business. Boesch hit home runs on consecutive days over the weekend, including a three-run blast on Saturday that turned a 2-1 lead into a much more comfortable 5-1 margin. MMM makes Boesch the Hero not because he was the most indispensable Tiger last week, but because he simply had a consistently productive, highly encouraging week in a seven-day stretch full of heroes. Dare MMM say The Stroke is back for Mr. Boesch? We've been fooled before, but this just has a different feel. Honorable mention: Rick Porcello, for his gem on Saturday in which he outdueled Chicago All-Star Chris Sale. In a 6-1 week, Goats are hard to find. So MMM is going outside the box this week. MMM is tabbing the folks who all but called 21-year-old right hander Jacob Turner a bust, following his horrific start on Tuesday against the hard-hitting Los Angeles Angels. Even some mainstream media scribes got into the act, as one of them said that Turner's stock as a trading chip "plummeted" after the Angels debacle. Five days later, MMM was listening to talk radio and Turner, who had just earned his first big league victory with 5.1 innings of three-run ball, was suddenly talked about as part of the reason why the Tigers' pitching will be OK, after all. But seriously, folks, just because scouts attended Tuesday's game---when Turner gave up seven runs in two innings of work---doesn't mean that his stock "plummeted." Scouts know better than to make rash judgments after one game. They know, already, a lot about Turner and probably also know that Tuesday was an aberration. So please stop the mood swings, Tigers fan base, aka this week's Goats of the Week. The trading deadline for interleague, non-waiver deals is a week from tomorrow. So in a MMM tradition leading up to the deadline, this week's UtM subject is GM Dave Dombrowski. Even with the team playing better, you can bet that all eyes will be on DD as July 31 nears. The Tigers are on fire now, but this is not a team without holes and needs. Second base, for one. One more starting pitcher, preferably veteran in nature, is another. The Tigers' sense of urgency has been dialed back thanks to the 13-2 run they're on, so DD should be able to have more leverage than when the team was scuffling. Still, MMM thinks if the deadline passes with the Tigers standing pat, that's not going to go over too well. But the move(s) Dombrowski makes don't have to be blockbuster in nature. In fact, with Andy Dirks apparently getting closer to returning from an Achilles injury, the Tigers' 25-man roster suddenly looks uber crowded. Who goes when Dirks returns? This isn't September, when the roster expands to 40. If Dirks comes back before then, someone has to go. DD, Tiger Nation turns its lonely eyes to you, ooh-ooh-ooh. Say goodbye to the creamy whites for nine games---the Tigers are headed back on the road. It's another three-city trip, and the first two legs are this week, in Cleveland and Toronto. The Indians are doing it again. The Tribe is wilting under the heat of summer, just as they did in 2011 after their surprising start. They didn't race out of the gate in 2012 as they did last year, but the Indians are nonetheless getting colder as the summer gets hotter. Their latest slide is at four games, and this one has put them under .500 (47-48). Remember when Cleveland closer Chris Perez crowed a bit too loudly after the Tribe swept the Tigers back in late-May? Remember when he smugly declared that while the Tigers may have bigger names, the Indians were more of a team? MMM is dying to hear what Mr. Perez has to say now. How's that "we don't have stars but we have a better team" thing working out for you now, Chris? Wait---is MMM the one crowing too loudly now? What do YOU think? The Indians get Doug Fister, Max Scherzer and Justin Verlander, in that order, this week. After three days in Cleveland, the Tigers take their road grays across the border to Toronto. The Blue Jays don't have their superstar right fielder Jose Bautista, who is on the disabled list. He'll miss the Tigers series. MMM is usually a little concerned when the Tigers play in Toronto, as it's one of the few ballparks with artificial turf, and the Tigers aren't exactly built for that kind of playing surface. But this year the Tigers have Quintin Berry, and the team's 1-2 punch of Austin Jackson and Berry at the top of the order, with their blazing speed, has MMM actually looking forward to this week's trip to TO. Porcello, Turner (presumably, barring a trade) and Fister get the nod this weekend in Toronto. Will the Tigers stay hot on the road? Don't touch that dial! Twenty five years later people in Detroit are still talking about John Smoltz for Doyle Alexander. It's the Motor City's version of the Alamo. It was around this time in 1987 when the Tigers traded blue chip pitching prospect Smoltz (Lansing Waverly), 20, to the then-awful Atlanta Braves for wily, irascible veteran Alexander, who was 36 at the time of the trade (he turned 37 in September). 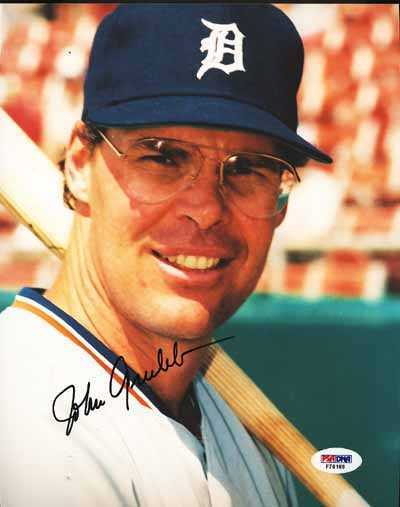 Alexander was lights out for the '87 Tigers, going 9-0 with a 1.53 ERA down the stretch as Detroit came from behind to nip the Toronto Blue Jays at the wire for the AL East title. Hall of Fame. But who knew? And that is the rub. It's been a quarter century since that trade and there are still baseball fans in this town who shake their fists and use it as their rallying cry whenever talk of trading a minor league prospect is bandied about. In San Antonio-like fashion, they cry, "Trade BLANK? Remember JOHN SMOLTZ!" Nick Castellanos is a nice looking player who terrorized Class A with Lakeland, which earned him a promotion to Double-A Erie. He's not doing all that bad over there, either. He, like Smoltz in 1987, is 20 years old. Castellanos is a third baseman by trade, but the Tigers seem to be set there with some guy named Miguel Cabrera, who is 29 and on the way to a Hall of Fame career of his own. As for Castellanos, there hasn't been a Greek athlete this popular in Detroit since Alex Karras. The Tigers are experimenting with Castellanos in the outfield, a move that is perhaps designed with two things in mind: to prepare Castellanos for a career in Detroit, or to make him more valuable as a trading commodity. Think about it: if other big league teams think that Castellanos is stonewalled at third base because of Cabrera's presence, the Tigers deal from a point of weakness. But if Castellanos is being groomed for the outfield, then the Tigers aren't buttonholed. Either way, the Tigers win with Castellanos. Prospects are just that---prospects. They're chips to be played at the table. But there is hand-wringing from the Alamo people. The thought of trading Castellanos (just one example) makes them queasy. As if the Tigers will never have another prospect ever again. Remember how we were told what a prospect Cameron Maybin was? How he was a five-tool player? A can't miss kid? Maybin was traded to Florida in December 2007, along with another supposed blue chipper, lefty Andrew Miller, in a deal that brought Cabrera, no less, to Detroit. Maybin then was sent to San Diego. He hasn't done much as a big leaguer. The ceiling for him now seems unreachable, judging from his big league numbers so far. You want the real deal? For every Smoltz, there are hundreds of Maybins. You want to place your chips on the smart money? Place them on the established big leaguer. Job One of any big league organization is to constantly develop players, i.e. trading chips. Some of those kids will be funneled through the system and eventually play for the club that drafted them. Others will be traded, usually for established big league players. You're afraid to trade Castellanos? Or right-hander Jacob Turner? Or lefty Andy Oliver? Or anyone else being grown on the farm? Tough. Then go out and draft and develop more prospects. For a contending team like the Tigers, when given the choice of hanging on to a "can't miss" prospect or trading said prospect to acquire a big league player to help NOW, the error should be on the side of risk instead of caution. You don't win pennants and World Series with kids or prospects. You win with good, solid major league players. You use the prospects to get those MLB players. Do those big leaguers always pan out? Of course not. But hey, do prospects? No, and even less so. This is big league baseball. High stakes stuff. The meek do not inherit this Earth. If you want to win, are serious about winning, then you have to take risks. You have to sometimes cut the cord with your supposed blue chip prospects. You have to trade them. Sometimes. In my book, there is no such thing as an "untouchable" prospect, unless that player is specifically penciled in for a position with the big league team immediately, i.e. Mike Trout of the Angels, 20 years old and an amazing talent. So forget John Smoltz. Please. It's been 25 years. Justin Verlander got torched in the All-Star Game, AL manager Ron Washington scolded him publicly, and JV was linked to supermodel Kate Upton. Oh, you mean what really mattered? The Tigers extended their win streak to six games, before losing a toughie in Baltimore on Saturday night, a 13-inning marathon. But---guess who---Verlander sealed the series win with surgeon-like precision on Sunday, using his scalpel, er, arm to carve up the Orioles on three hits in eight shutout innings. It was a big series win, maintaining the momentum---if there is such a thing in baseball---from before the break. Rookie lefty Drew Smyly landed on the disabled list, retroactive to July 7. He has a sore side. What is it with Tigers pitchers and sore sides this year? Jacob Turner starts on Tuesday. One more thing: Miguel Cabrera is playing like he plans on simply taking his first MVP Award, simply because he wants it. He hit two baseballs over the weekend so hard that MMM feels sorry for the cowhide spheres. MMM only has three games to work with when it comes to Hero and Goat this week, but as you know, that's enough to come to a decision. MMM likes Miguel Cabrera, because the ferocity of his power---to center field and right field, no less---put exclamation marks on the Tigers' two wins in Baltimore. Cabrera is gaining on Texas's Josh Hamilton for MVP consideration. Hamilton appeared to be running away with it in April and May, but he's cooled off and Miggy is on a mission. His power knows no bounds. His flair for the dramatic is unparalleled. His hitting approach is elite. Take Sunday's bomb in the ninth inning. That poor kid Steve Johnson never knew what hit him. But just a couple pitches prior to the homer, Johnson tied Cabrera in knots with a wicked curve ball. No matter. When the kid tried to paint the black with a fastball on the outside corner, Cabrera swung at it as if the baseball was on a tee. The result: a 420+ foot home run to center field that might have had a flight crew and peanuts on it. That followed a rocket on Friday night on a pitch that was low and a little outside. Miggy plays no favorites and takes no prisoners. Honorable mention: Verlander, for his series-winning gem on Sunday. MMM feels kinda bad about this, but he only had three games with which to work. Joaquin Benoit, you're this week's Goat. MMM feels bad because Benoit has been mostly terrific this season. But had he not given up two home runs in the 13th inning on Saturday, the Tigers would be working on an eight-game winning streak. And, the White Sox lost on Saturday. Twice the Tigers had a chance to win in extra innings Saturday, and after Jose Valverde blew it in the 11th, Benoit did the same in the 13th. So why not Valverde as Goat? Benoit gave up two homers, number one, and the second was to a guy, Taylor Teagarden, who just came off the disabled list and wasn't even expecting to play, let alone be a hero. Is the real Brennan Boesch on display, or is this just another tease? Boesch, the sometimes confounding right fielder, has been hitting well as of late. Even balls he isn't hitting all that well are dropping in for base hits. MMM wants to believe that Boesch, along with Jhonny Peralta, is getting back to his 2011 level of play (before Boesch hurt his wrist). If so, MMM loves the Tigers' chances in the second half. MMM is putting Boesch UtM until further notice, not convinced that this recent hot streak is a harbinger of things to come. The Tigers marketing and sales departments must love this post-break homestand. The Angels and the White Sox? One team making a run for its division, with marquee players and a rookie phenom, and a team the Tigers are chasing? And a natural rival, to boot? What a way to kick off the home portion of the second half schedule, eh? The Angels invade for four games, and the only thing that will be lacking is that neither Jered Weaver nor Verlander will pitch. But it will be the Tigers and their fans' first look at rookie Mike Trout, who is leading the league in hitting at age 20 (he'll be legal to drink on August 7). Oh yeah, and there's that first baseman the Angels signed in the off-season---Albert something or the other. As for the White Sox, MMM isn't convinced they can keep up their first place pace in the second half. Too many rookies, including their manager. But Adam Dunn is the Dunn of 2010 and prior, and Paul Konerko and AJ Pierzynski are two of baseball's most underrated players, in MMM's humble opinion. Or, in today's text message age, IMMMHO. Still, the rookie thing gnaws. Or maybe it's just wishful thinking. Regardless, this ought to be a wild and wonderful week of baseball at Comerica Park. To quote last week's MMM: "MMM expects no less than a 5-2 week and an All-Star break record of 44-42. Then, let the chips fall where they may." OK, so let's watch those chips fall! MMM is feeling pretty good about himself after kinda, sorta being a soothsayer as the Tigers got that 5-2 record, albeit the hard way: two losses followed by five straight wins. MMM called it a defining week, and by those standards, the second half looks promising. The 5-thru-9 hitters (especially Delmon "ground out 6-3" Young) are heating up, and it's no coincidence that as they have, the Tigers offense has come alive. Well, one guy still is cold as ice, and we'll discuss him later (though I'm sure you can guess who it is). Teams that go into the All-Star break on a winning streak have a certain amount of frustration. When you're on a losing streak or a hot streak, the idea of not playing can be good or bad. Good if you're losing (get away from it for a bit), bad if you're winning (you can't wait to get to the ballpark when you're winning). The Tigers probably hate to put everything on pause right now, but the schedule maker says you have no choice. The Twins and the Royals are the two teams beneath the Tigers in the standings, and our boys treated them as such, though the week got off to an ominous start. If nothing else, MMM thinks Tigers fans should enjoy the next four days, knowing their team is showing signs of being reanimated. MMM has looked cross-eyed at Delmon Young for most of the season, getting weary of the ground outs to shortstop and the first-swing fly outs. But Young has caught fire, drilling home runs in each of the last four games, and the rest of the hitters behind him seem to be catching whatever Young has. MMM has said time and again: the Tigers' uneven first half has mainly had everything to do with the lack of 2011-like production from the guys hitting after Miguel Cabrera and Prince Fielder. Young is definitely one of those guys whose 2012 has not been what was expected---in a bad way. But with Delmon heating up, and guys like Jhonny Peralta showing signs of life (heck, even Ramon Santiago is hot! ), MMM thinks we could be heading for a rock-and-sock 'em second half battle with the White Sox and Indians. So Young is the HotW, if for no other reason than his timing. His hot streak going into the break is something to feel good about for a few days, for sure. Honorable mention: Fielder, whose near .300 BA is now being augmented by fearsome power. And he's hitting more than just solo homers, to boot. OK, this is the All-Star break. Ryan Raburn, take off your suit and reveal that Superman outfit underneath. Like, right now. Raburn is on the verge of being booed out of Detroit, like Brandon Inge was. It's not like he doesn't deserve it, and it's not like Raburn hasn't been given enough chances to redeem himself. The BA still hovers around his weight, and if there's anyone in MLB who gets called out on strikes more than RR, then MMM wants documented proof. And Raburn isn't making up for his lack of hitting with fielding prowess. Not by a long shot. Seems like wherever Jim Leyland plays him---and why Leyland IS playing him and NOT batting him ninth when he does, is the $64,000 question---the baseball finds Raburn in the field. You just can't hide his glove. MMM is reminded of a clever line from years ago, when TV cameras caught poor fielding Dave Kingman re-lacing his glove. "They ought to send for a welder," the announcer said. Raburn, on the one hand, is hardly a key player. But this is the time when he supposedly catches fire, so let's see it---or else. This is a dark horse, outside-the-box UtM this week. And it's not so much an UtM for just this week as it is for the second half of the season. Villarreal is this year's Al Alburquerque: high strikeout guy who blows people away with a slider. Seemingly unhittable at times. But AA had a second half in 2011 that was pocked with inconsistency then an unfortunate incident in Baltimore, when he was hit in the head by a baseball during batting practice, giving him a concussion from which he never recovered. MMM is watching Villarreal to see if he continues to make hitters look silly out of the bullpen in the sixth and seventh innings, over the season's crucial second half. So consider this MMM's mid-season UtM for 2012, Part II. Leyland said something interesting in his post-game comments on Sunday, as spoken to FSD. The skipper said that the All-Star break can end up NOT being a break for players, depending on how they handle it. His reasoning? Lots of travel, lots of arrangements to see family and friends, lots of personal stuff to attend to. "If you don't handle it right, it's not much of a break and you come back just as tired as you were before you left." MMM thought that was an interesting take on something we all assumed was 3-4 days of rest. So the maybe-rested Tigers will invade Baltimore, whose Orioles switched back to the cartoon bird on their caps and have had a pretty solid first half. But the Yankees have been the Yankees and have taken control of the AL East, at least for now. The Orioles, though, are right there for a wild card spot, and they haven't had October baseball in Baltimore since the late-1990s. Adam Jones has been the man for Baltimore, having a breakout year (20/44/.289/.864 OPS). And catcher Matt Wieters is finally living up to his potential more than he ever has. The closer is All-Star Jim Johnson (26 saves, 1.21 ERA). MMM hopes the Tigers aren't looking past the O's to next week, which features seven home games against the Angels (4) and White Sox (3). The All-Star break has a funny way of cooling off and heating up teams. Which will it be in the AL Central? Stay tuned. The Tigers grinded through the rest of their 10-game road trip by stumbling in Texas then righting themselves in Tampa. The trip, which included a stop in Pittsburgh, ended with a 5-5 record, which is pretty much what the team deserved. Sometimes the best thing about a long three city road trip is just surviving it with minimal damage to the W/L record and the place in the standings. Based on that criteria, the Tigers did OK. They left for Pittsburgh one game below .500 and a handful of games out of first place. They return home from St. Petersburg one game below .500 and a handful of games (3) out of first place. It was a week that, if the Tigers opponents were prize fighters, you'd say started with some slug fests and ended with some finesse. The Tigers went toe-to-toe with the Rangers and tried to out slug the two-time defending AL champs, with minimal success (they lost two of three). Then, in Florida, the Tigers found a very different opponent in the Rays, who like to use rope-a-dope and out box you. The Tigers won three convincing decisions out of four in Tampa to make it a 4-3 week. The week even contained some cool nostalgia, as the Tigers wore 1979-era road unis on Saturday. 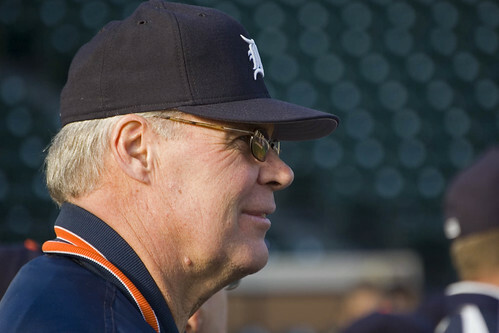 It was also revealed that minor league hitting instructor Toby Harrah would stay with the Tigers the rest of the season to help hitting coach Lloyd McClendon. MMM feels sorry for pitchers, because it's hard for them to achieve HotW status, unless they pitch in multiple games. And for starting hurlers, that's sometimes just not possible. Rick Porcello got two starts last week and made them both count. In fact, it was the 23-year-old Porcello, not Justin Verlander, who was the "go to" guy on the staff last week. Porcello pitched Monday in Texas and was very good. Then he pitched in Tampa/St. Pete on Saturday and was even better: seven shutout innings, just 87 pitches. Two great starts, two wins for Ricky---and in a week when Verlander stumbled in his lone start, the Tigers needed them even more. MMM is also squeamish about heaping too much praise on Porcello, because while fellow starter Max Scherzer's inconsistency goes from start to start, Ricky's sometimes goes from batter to batter, inning to inning. Even three straight strong starts by Porcello isn't enough to make MMM think that no. 48 has figured things out for good. But they ARE good enough to get him named as last week's Hero. Honorable mention: Austin Jackson, whose presence at the top of the Tigers' lineup is more crucial now than at any other time in his brief career in Detroit. Since his return from the disabled list, Jackson has been brilliant, his plate discipline, approach and confidence all soaring now. MMM thinks that Jackson is a player who has clearly benefited from adjustments made over the winter with hitting coach Lloyd McClendon. But funny how the McClendon haters aren't about to give the coach any credit with AJ. MMM is wondering what is wrong with Doug Fister. The Tigers' anointed no. 2 starter was destroyed in Texas on Wednesday night, surrendering eight earnies and totally not giving the Tigers a chance to win the series with the Rangers, though the game did end in 13-9 madness. Fister's ERA is nearly 4.00 and MMM is wondering if he's totally healthy. And if he IS healthy, MMM demands to know what happened to the 2011 Fister. What happened, likely, is what has happened to guys like Alex Avila, Jhonny Peralta, Delmon Young et al. That would be the unsettling notion that each of the above had career-type years last season and what we're seeing in 2012 is more representative of what those guys have to offer. MMM wonders the same about Fister. This is not to infer that MMM thinks Fister isn't still a good starting pitcher. But what he did for the Tigers after coming over from Seattle last year is looking more and more like an anomaly. In other words, the "real" Doug Fister is probably somewhere between the 2011/Detroit version and what we're seeing right now. Regardless, Fister is this week's Goat, for throwing a start away in the rubber game of an important series. MMM just knows that the Lloyd McClendon haters are having a field day, already, with the Toby Harrah news. Harrah, the Tigers' minor league hitting instructor, has been quietly with the big club for a couple weeks, ostensibly to assist McClendon in trying to awaken the Tigers' hunt and peck offense. Last week the Tigers officially announced that Harrah will remain with the Tigers for the rest of the season. McClendon was asked if he welcomes Harrah's help and of course Lloyd said yes. What else was he supposed to say? The Harrah-McClendon arrangement isn't totally peculiar. A few teams this season are going with two hitting coaches. But that won't stop the speculation and, for some people, the wishful thinking. MMM, for what it's worth, thinks there isn't anything sinister in Harrah's presence. MMM believes it to be just what the Tigers say it is---an extra pair of eyes to help McClendon. And this isn't the first time Harrah has been summoned for help, though it will be for the longest stretch that he's ever done in Detroit, with the exception of when he was the team's hitting coach in 1998. But if the Tigers offense continues to perk up as it has for the past 10-15 games, then MMM doesn't think we'll hear too much about Harrah-Mac, unless it's in a positive way. MMM, not one for hyperbole (quiet), has a bold statement to make. This week just might be the most crucial, and most likely to define the season for the 2012 Tigers. They have seven straight home games---where they haven't played as well as they have in recent years---against the two teams below them in the division. It's leading up to the All-Star break. It's the first real chance to bob above .500 and stay there, in quite some time. And it's an excellent opportunity to make the White Sox and Indians less comfortable. So for that reason, MMM believes the Tigers stand on the precipice ($20 word) of a week that could truly turn their season in the right direction. So no scouting reports this week of the opponents. No fawning over the other teams' stars. Just this: MMM expects no less than a 5-2 week and an All-Star break record of 44-42. Then, let the chips fall where they may.